As most of you likely know, Metro has been developing the Union Station Master Plan to preserve the historic train depot while also renovating it and redeveloping parts of the 40-acre campus as use of the station continues to grow. A companion study has been looking at an equally important issue: better linking Union Station by foot and bike to surrounding neighborhoods. Union Station sits on the far northern end of downtown Los Angeles and, at present, it’s often not terribly pleasant to reach via sidewalk or bike. The linkages study — called Connect US — seeks to remedy that by recommending 13 separate projects totaling $50 million to $60 million in costs that would create a series of corridors that walkers and cyclists could use between Union Station and the Regional Connector’s 1st/Central Station and surrounding neighborhoods. Among those communities: Chinatown, Boyle Heights, Little Tokyo, the Civic Center and the Arts District. A PowerPoint of the study’s recommendations, presented by community members last Thursday at a City Hall event, is posted above. As you scroll through, there are a series of maps and renderings that provide an idea of the scope of the project. Among the improvements: an esplanade between the entrance to Union Station that would reach across Alameda Street to El Pueblo de Los Angeles and Olvera Street; new esplanades with expanded sidewalks and protected bike lanes along Los Angeles Street, Alameda Street and North Broadway (which would sit on the bluff above Los Angeles State Historic Park), and; add bike lanes (some protected) and sidewalk and street improvements to other key streets such as 1st Street, 3rd Street and Santa Fe and Alpine. Metro is helping to plan the improvements, which will largely be undertaken by the city of Los Angeles (the city oversees downtown streets). The project has been separated into a series of smaller projects, the idea being that each project can be done when funding becomes available, a nod to the realities of transportation funding. The final speaker at last Thursday’s event was Gil Penalosa, the well-known former parks chief in Bogata, Colombia, and who now heads up 8-80 Cities, a nonprofit that advocates for parks, bike lanes, pedestrians and making cities more vibrant and sustainable — the kind of things people usually like in cities. As he made clear, the Connect US plan would not only help improve mobility in downtown but would make L.A. more like other well-known cities across the globe that are walk- and bike-friendly and that people love to visit. 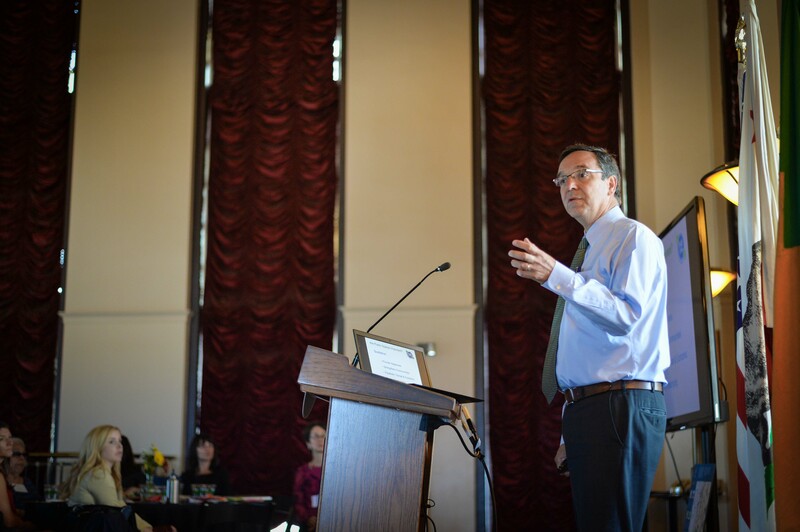 Gil Penalosa speaking at last Thursday’s event unveiling of the Connect US plan at Los Angeles City Hall. Photo by Steve Hymon/Metro. If I understand correctly, it sounds like ConnectUS is a rebranding of the “LA Union Station and 1st/Central Linkages Study”, which is great because the latter project title doesn’t exactly roll off the tongue. Will the http://www.metro.net/projects/linkages/ webpage be updated with the new name and a new URL? Yes, they decided to rename it. I expect that web page will be updated, but not sure when. I’ll let team know it needs to get done. A nod to the realities of transportation funding? Nonsense. This is about skewed priorities. We somehow can pull the money together blow a BILLION on 1 mile of freeway widening and millions more studying the possibility of tunneling a freeway (which, if built, surely costs more than all the most comprehensive proposals in Connect US combined). If Metro and Los Angeles cared about a sustainable future, money spent on walking and bicycling facilities would be comparable to money spent on automobile infrastructure. No money for decent bike parking, but plenty to built multi-story parking lots for cars, which provide free parking. The proposals in the document are fantastic but they are not being constrained by lack of money available, they are being constrained through a lack of prioritization.